Madaz checking in here! Back in action with another technical analysis blog! 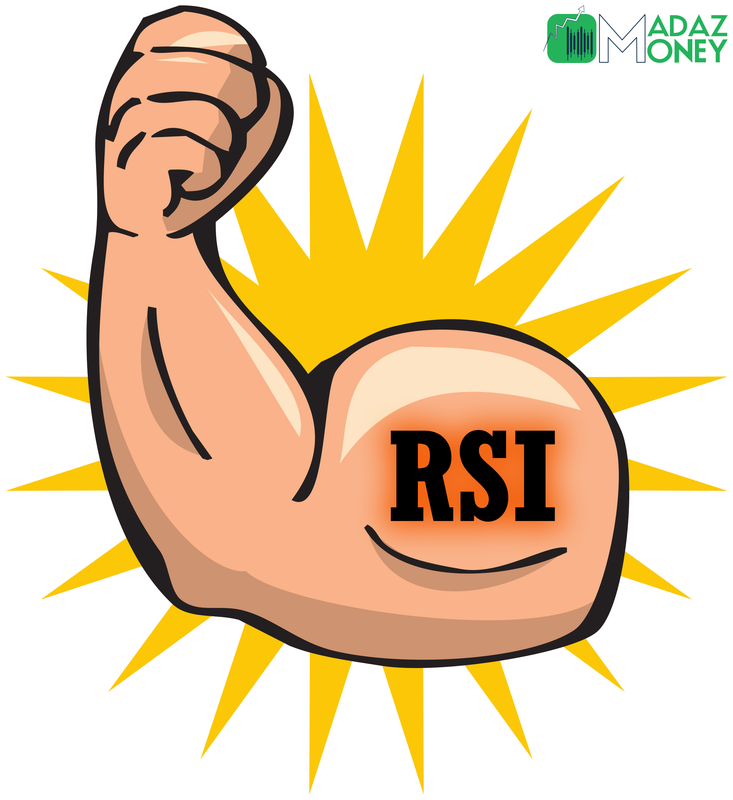 This time lets talk about the Relative Strength Index (RSI). If you wanted to find out who was stronger between you and your buddy, you’d probably just simply go and see who can pump more iron at the gym. If you wanted to compare which car has more power, you’d probably look at something like torque or horsepower. But what about stocks? How do you determine which stocks are strong and which are weak? So while stocks can’t exactly go hit the bench press to find out how strong it is, the RSI (Relative Strength Index) DOES offer us a nice metric to identify the amount of momentum in a stock, which is measured on a scale from 0 to 100 with a key focus area on 70+ (Overbought) and -30 (Oversold). The higher the RSI value, the stronger the stock and the lower the value, the weaker the stock is. Pretty simple, right? But first, lets start with time frames. An important thing to note is that the value of RSI will vary depending on the time frame you prefer. For instance, if we look at a short term time frame such as a 1-minute chart, the RSI may suggest that price is oversold indicating that a reversal may be in order. However, if we switch to a slightly longer time frame such as a 15-minute chart, the RSI might have a different reading! It is important to understand this so you can properly interpret and apply RSI as confirmation in our current trading plans. Lets actually take a live example on $TLRY from today, September 12, 2018. Here is a 1-minute chart of $TLRY. Notice how at 9:20 AM we have a steep sell off and the RSI paints red on the index? This is a signal that price may be over extended here at these lows. Look at how price completely reversed after this signal and went on to run another 5+ points from lows! A 1-minute chart of $TLRY demonstrating a stock that has dipped past an RSI value of 30, indicating it is oversold. Now let’s switch to a 1-day, 15-minute chart. 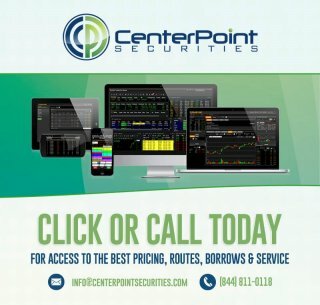 We can see that at the same time the 1-minute chart above indicated an oversold RSI level of below 30, this 15-minute chart actually has RSI values of around 60 for the same time on the same stock, indicating that $TLRY is actually within striking distance of being considered overbought. Also look at the beautiful overbought signal on the first candle at the open! Our RSI clearly indicates that price is over extended here and is due for a reversal. Sure enough, price engages in a total bearish reversal and fades over 7 points from the highs! A 15-minute chart of $TLRY on the same day showing different values of RSI at the same time and actually giving an overbought signal at the open as RSI levels were over 70 at that point. So Madaz, thats great and all but HOW do we actually put it together? Well, lets add some good ol’ trusty support and resistance to the mix! 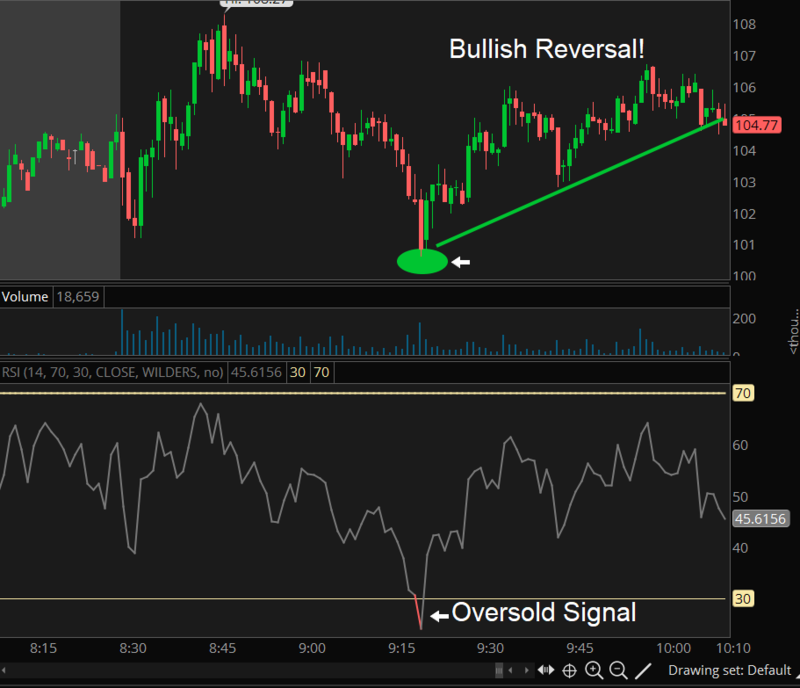 Here is the same 1-minute chart on $TLRY that we used above to spot the RSI long signal at 9:20am, now lets add in a very important support level that was successfully tested at the open. See how we are developing a trade plan? Step 1: Identify support – Step 2: Wait for oversold signal into support. Now we’re getting somewhere! The more signals we can use to confirm our trade plan, the better! 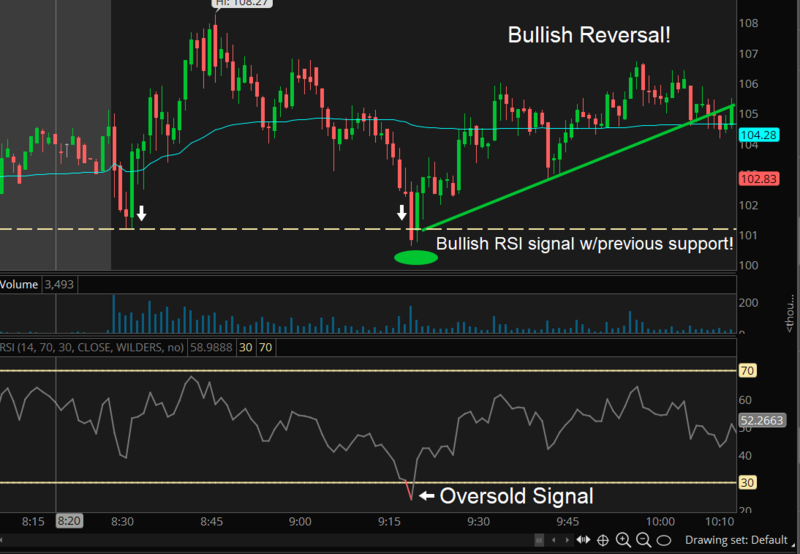 RSI being used in conjunction with basic support and resistance to determine a bullish reversal in trend. Sweet move, right? These are things any of you can apply quickly and easily right now with a little practice. Now for all you BEARS out there, let’s look at that short example on the 15-minute chart. 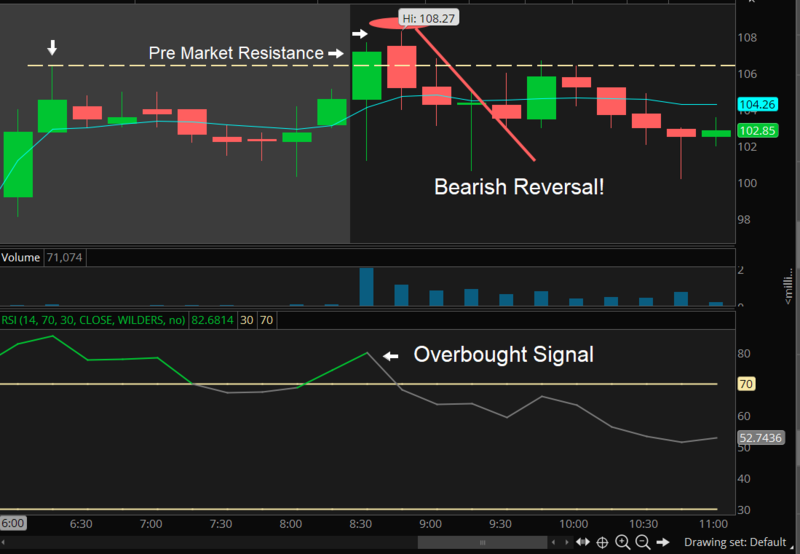 See how I’m using pre-market resistance in conjunction with the overbought RSI signal? Using an actual level helps us pinpoint our entries. This was a great move to the downside with a defined entry plan. 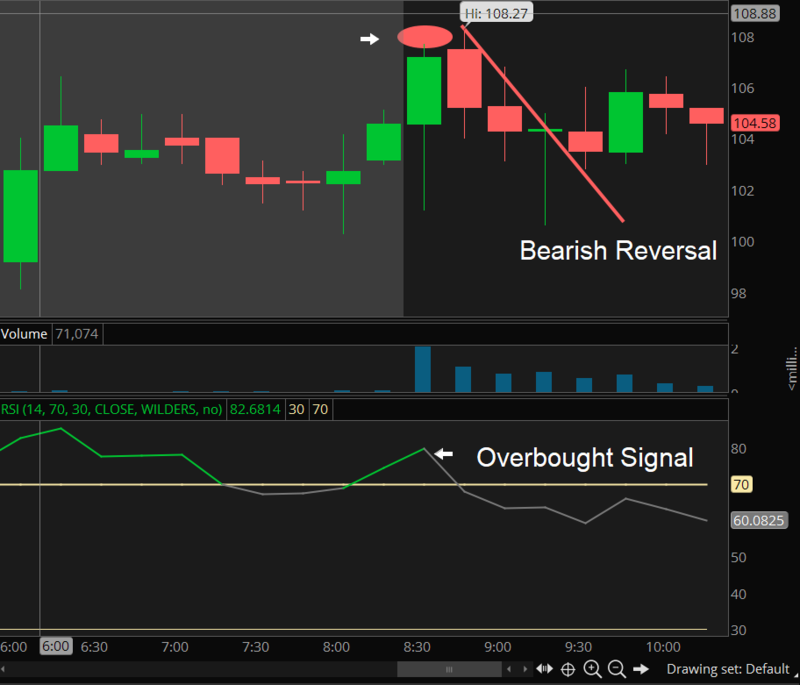 Pre-market resistance being used in conjunction with an overbought RSI signal to determine a bearish reversal. Now that we’ve seen some examples of RSI in action, we can see that the stronger a stock is and higher the RSI gets, the more likely a correction will take place. If you want to buy a particular stock you may want to wait till it “pulls back” before getting in so you don’t get stuck chasing bad prices due to FOMO (fear of missing out). Same thing on the flip side, if you are short and the RSI is extremely low you might not want to chase it lower without waiting for a bounce. One of the great positives of RSI is that it’s considered a leading indicator, which aids in predicting future price action as opposed to a lagging indicator, such as a moving average, which often gives delayed signals in the price action. The main concern with RSI is that it shouldn’t be relied upon solely as a buy/sell indicator in determining price action as a stock that is considered overbought once it taps that RSI value 70 may not necessarily reverse. Likewise, a stock that taps an RSI value of 30 indicating that it has wandered into oversold territory, may not necessarily bounce. This is why we always use other tools like support and resistance levels, VWAP, and other indicators to help build a clearer picture of how the stock is going to behave. That’s it guys! Now you’re officially an RSI expert! 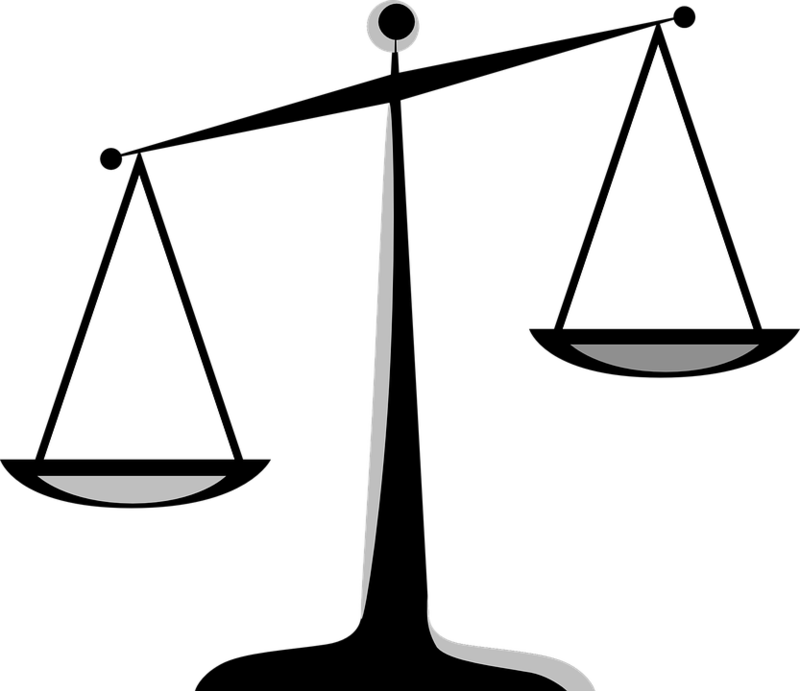 I hope you enjoyed this quick and effective blog on how to implement the Relative Strength Index (RSI) into your trading. Now we have one more tool we can use to keep us SAFE on our #NoBlowupChallenge! Make sure to check out my VWAP article and combine both indicators to see what you can find! Remember to share this on Twitter/Facebook/YouTube/Instagram and like/favorite as your support helps drive me to create more FREE content for you guys! Also drop a comment below: what would you like for me to write a blog or make a video about next?